Fear runs rampant throughout Tokyo with the revelation that demons in fact exist amongst us. Paranoia and the darker side of humanity boils onto the streets as people turn on one another, suspecting that anyone could in fact be a demon hiding in human clothing. Amidst the growing tensions, tragedy strikes Akira causing his mind to snap, retreating into his subconscious, allowing his Devilish alter-ego Amon to break free from Akira's cage of flesh and wreak havoc on both human and demons alike. I want to write this review in order to provide a more balanced view of this OAV. It's not as good as the previous Devilman OAVs. It is the weakest anime adaptation of Devilman and isn't really as good as Violence Jack either, despite being equally as violent. However, I feel that like Violence Jack, it gets too much of a bad rap. In itself, this OAV effectively managed to translate some of the more harrowing scenes of the original Devilman story to motion, and it does those scenes justice. Besides that, the end sequence goes back to the whole message and point of Devilman quite well, about a man coming to terms with the bestial nature of the human race through the symbolic interaction of his soul with a demon's. Where it suffers is in the middle. It's pretty much a set of extremely violent confrontations, and not much else. However, even these do present to shock much like Go Nagai treats violence in general. In recent violent animes, the violence isn't strong enough to shock. But Go Nagai's works, they always are, are meant to be, and I think some people forget that, and are too quick to rubbish them, and thus don't take them in the right way. I don't think anyone who realises that needs "professional help" but rather know how to react to a work that actually shocks them in this day of strong desensitisation. 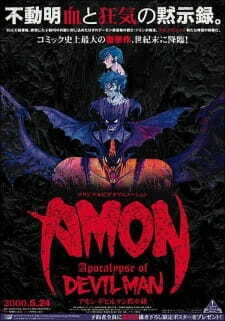 So, to summarise, whilst the Amon OAV is not great, it is a solid addition to the Devilman lore and if nothing else, allows it to keep it's crown as the most infamous, and meaningful, violent story in anime and manga culture. My very first anime experience, (aside from mass market dubbed kids cartoons in the 80's) was the Devilman OVAs; The Birth &amp; Demon Bird. I have never fallen out of love with these &amp; as of this writing, they remain at the top of my favourites list. When I found out about Amon I knew I had to watch it. As a pre-existing fan of the series I knew the characters &amp; backgrounds but if you haven't seen the OVA's there's very little chance you're going to fully understand what's happening. The plot is quite simple, however its almost completely buried beneath the extreme violence &amp; questions. i.e Who the hell is that? What's exactly is happening here? &amp; What the hell? - Where all questions I repeatedly asked myself throughout the watching. I'm quite desensitised to animated violence but there are several scenes which made me think; ok, that's going way too far. The art &amp; sound I can't really fault as there's nothing wrong with them and as long as you've have seen the OVA's you know who the characters are (well most of them) but there has been an obvious passage of time between installments and there is little explanation given to who new characters are &amp; what they're doing there. I was disappointed that I couldn't enjoy this as much as I wanted to. It feels as though it was only half way done when it finished &amp; that there was supposed to be another installment. I would not recommend this OVA if you haven't seen the originals. If you are already a Devilman fan then you might enjoy this as a small side piece to the overall saga but you also might find yourself annoyed at the almost lack of respect shown to the characters. First let me start by saying this, I'm pretty desensitized to violence. Elfen Lied was my first anime, Gantz was my second. Ive seen all of fist of the north star and was barely phased. However, this 40 minute ova has, gore wise, single handedly outdone all three of those combined. I came across this OVA, being a fan of the first two devilmans, wondering why I couldn't find any information, on this one. in fact the only review i found warned &quot;if you find it enjoyable or worthy in any way then seek professional help.&quot; I just laughed and commenced to watching... let me say this, that wasn't far from the truth. However, I might as well start out with the (Brief) positives to this movie. The animation is actually very good, It puts go nagai's nice art style into this nicely budgeted 2001 OVA. And the sound is awesome as well, the actors seem great at making death sounds, and they must have had hundreds of death sound effects, not a single death has the same flesh ripping, bone smashing, blood squirting sound! The positives end there, as the rest of the film is a practically an animated train wreck with too much red paint. The movie starts off in a not so bad way with what appears to be a little girl running from a man in a populated city, however he is not a man he is some nameless snake demon thing, oh and the girl is also some octopus demon thing. (I wish they actually named the characters) oh yeah, only three characters in the film have names Akira (also known as devilman) Amon, and Ryo however, if you want to know who they are, youll have needed to see the first two devilman movies, barely anything is spoken, except such memorable lines as &quot;I want to fight you&quot; and &quot;Die&quot;. Anyway, Akira comes in and saves the day, but when more demons show up, he explodes (yes, he explodes) and turns into the villan of the film, leading to more off a massacre between demons. oh and cannibalism in a way makes the one in violence jack look like no big deal. after more brutallity, we see that Akira is still alive inside amon and they have another very gory battle. If i wasnt so desensitized, i would have probobly puked at leasted thrice during this film, really, unless you are making a death metal amv, or are really into just pure gore, stay far from this title. very far. For an anime that came out in the early 2000's, this is more in the mold of ultra nihilistic 80's/early 90's shock anime like MD Geist and Genocyber. Unlike those, though, it doesn't ever conjure that "fun," free wheeling and frenetic aura that make those films, while not great, watchable in a certain mindset. A lot is made of this adapting Go Nagai's "style;" no, not at all. The animation is crude and slapdash compared to the original Devilman OVA's; It definitely looks and feels like a deadly serious sequel to Apocalypse Zero with its straight up ugly character designs and ugly ways of having said character designs dismembered, disemboweled, etc. So what we have here is a serious story that at the same time is incredibly stupid and pointlessly brutal. I gave it a chance because I actually like the Devilman manga and aspects of the simplified OVA's. It's trash. Should I finish Amon: Devilman Mokushiroku?